Dallas is a two year old male greyhound who was rescued by NGAP from one of the tracks. In general, he seemed like a happy and healthy boy, but more aggressive than the average greyhound. He also did not have two testicles in his scrotum because one of the testicles did not descend properly. When this happens, we call this a cryptorchid. A normal neuter involves making an incision into the scrotum and removing the testicles. A cryptorchid surgery is much more involved, often requiring entrance into the abdomen to find the other testicle. We want that testicle out of the dog in spite of the inconvenience. It is a lengthier procedure and will cost more, but leaving it has priceless consequences—such as cancer and testosterone related behaviors. Dallas′s first testicle was removed without incident. However, when his abdomen was opened, we found a surprise before even looking for the testicle. His spleen was irregular and very large. After careful evaluation, we elected to remove the spleen. Removing a spleen is not a simple procedure. 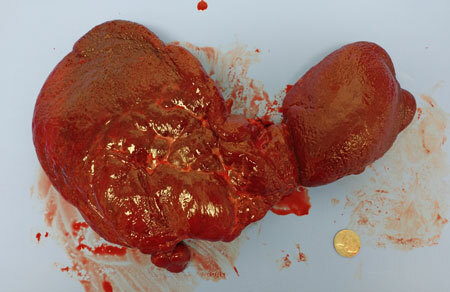 The spleen, an organ involved in producing and circulating blood, can be taken out of a dog or cat and they can live a long and happy life without it. The procedure itself requires vigilant tying off of blood vessels so there is no bleeding, but once the spleen is out, and bleeding is under control, animals can do great. Dallas had no issues with his splenectomy. Dallas′s spleen looked like it had scar tissue and adhesions. It is possible that he experienced trauma at the track and the spleen was either ruptured or broken, leading to its current appearance. There did not appear to be any cancer, although spleens commonly become cancerous as animals get older. 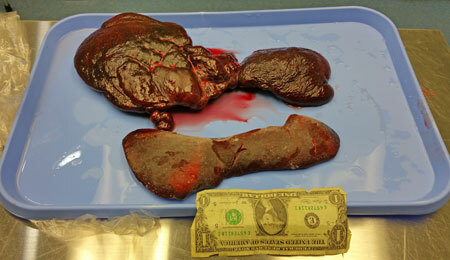 The biopsy reported as a splenic hyperplastic nodule or a splenic hemangiosarcoma. We believe this non-specific finding was probably due to a significant trauma as opposed to hemangiosarcoma. We removed his spleen, we removed his testicle, and Dallas woke up uneventfully. It is of grave concern that Dallas may have experienced trauma. A kick from a human is most concerning. it would account for the appearance of his spleen, as well as his aggressive behavior prior to the surgery. There is the outside possibility that this could be an injury that was race related although an injury of this significance we would have thought it would have been noted in some way. in looking at past racing records it did indicated that he was disruptive during a race; disruptive usually means fighting. That being said, the dogs are all muzzled. 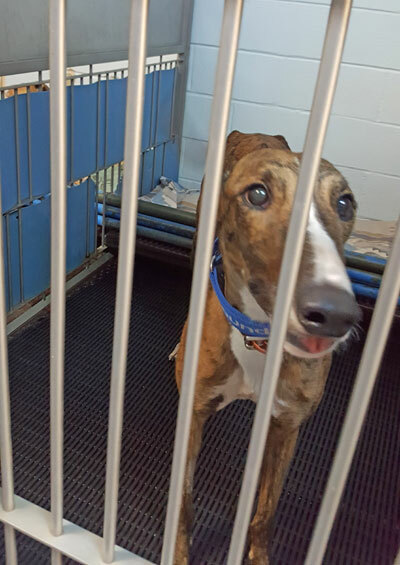 The thought that a trauma occurred without notice by both track officials and the kennel operator is worrisome. In any case Dallas′s splenectomy, which of course finding it through a cryptorchid was a fluke, certainly saved his life. His spleen staying in the condition that we took it out would have only continued to degrade quickly into a huge mass. At some point it would have possible that we would have not been able to save his life—in this case, maybe we should change his name to Lucky. Either way, he may have been in pain from such a disfigured spleen. We are hoping that removing it will possibly help him forget such trauma, or at least remove a source of discomfort that may have been affecting his behavior.